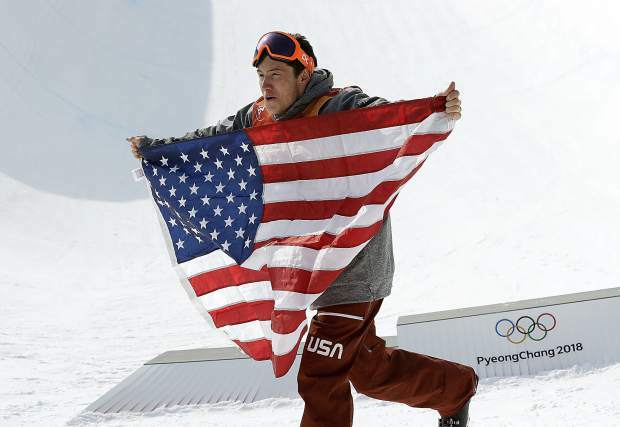 Silver-medal winner Alex Ferreira, of Aspen, celebrates after the men's halfpipe final at Phoenix Snow Park at the 2018 Winter Olympics in Pyeongchang, South Korea, on Thursday, Feb. 22. Alex Ferreira didn’t make the 2014 Olympic team and it haunted him for years. But Thursday in South Korea, the Aspen freeskier was able to banish those demons forever. With his family watching, the 22-year-old Ferreira made the most of his first Winter Olympics by winning a silver medal in the men’s halfpipe in Pyeongchang. Less than a year ago, rattled by injuries and failures, Ferreira came close to leaving competitive skiing behind. But Thursday’s silver medal brought everything full circle for the Aspen High School graduate. Ferreira’s third-run score of 96.40 was bested only by the 97.20 scored by Nevada’s David Wise, one of Ferreira’s best friends and teammates. Wise also won gold in 2014, the first time halfpipe skiing was included in the Olympics. New Zealand’s Nico Porteous surprisingly won bronze, while Crested Butte’s Aaron Blunck settled for seventh and Basalt’s Torin Yater-Wallace finished ninth. Entering the Pyeongchang Games, the U.S. foursome was favored to leave with a podium sweep. The possibilities seemed very real after Blunck, Ferreira and Yater-Wallace finished 1-2-3 in Tuesday’s qualifying, where Wise qualified eighth after landing his second and final run. But after the first of three runs in Thursday’s finals at Phoenix Snow Park, Ferreira was the only American truly holding up his end of the bargain. His first-run score of 92.60 led the competition early, holding off Canada’s Noah Bowman and New Zealand’s Beau-James Wells. Blunck was sixth after his first run of 81.40, but Yater-Wallace only scored 65.20 on his first run after backseating his landing and Wise couldn’t even complete his run. The real surprise came early in the second run, when the 16-year-old Porteous scored 94.80 to overtake Ferreira, at least temporarily, on the podium. Ferreira was the only one to answer the young Kiwi, scoring 96 on his second run to retake the lead two-thirds of the way through the competition. Wise, who also crashed on his second run, overtook Ferreira on his third and final run. Ferreira had one more chance to reclaim that podium’s top spot and left it all out there with his best run of the night, but still came up just a hair short of Wise. Prior to the contest, Ferreira and Wise each got tattoos together in South Korea. Yater-Wallace crashed on both his second and third runs. Making finals in South Korea was a step up from Sochi in 2014 when he failed to make it out of qualifying. Yater-Wallace did not talk to reporter immediately following Thursday’s finals.